The Japanese prime minister has his eye on tax reform and Japan’s looming population crisis. 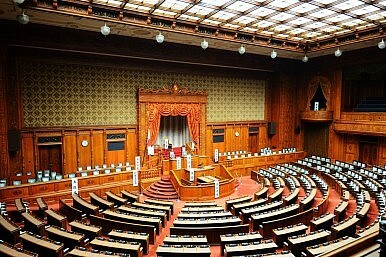 With the extraordinary session of the Diet set to start on September 29 and run through December 6, the ruling Liberal Democratic Party (LDP) has a number of items on the agenda that it would like to see significant movement on in the fall. While the issues of collective self-defense and the legalization of casinos are likely to be brought forward, the government has already begun to discuss what will probably be significant pieces of policy. With a little over two months to work on legislation within the Diet before it breaks for the regular session next spring, the government is looking to formally outline substantial new plans on population decline while biding its time on the next tax increase, until what are expected to be positive third quarter economic figures are released. Meanwhile, the LDP’s new Secretary General Sadakazu Tanigaki said on Saturday that the new consumption tax increase must go through. According to the Jiji Press, Tanigaki said “We should not put off things in the broad direction. We can overcome risks associated with a tax increase by a range of measures, but it would be difficult to respond to risks stemming from a decision not to raise [the tax].” While he had told the press on September 3 that his views were largely in line with Abe’s, on Friday he held talks with the LDP’s coalition partner and leader of New Komeito, Natsuo Yamaguchi, as well as former Prime Minister Yoshihiko Noda of the Democratic Party of Japan (DPJ). The three men headed their respective political parties in August 2012, when they jointly decided to implement a two-stage increase in the consumption tax, and Tanigaki’s change in opinion is likely linked to this meeting. In addition to what is expected to be a very difficult and potentially politically costly decision over the tax increase, Abe is preparing to outline “bold measures” to address depopulation, with the goal of having a new comprehensive policy by the end of the year. The decision comes at a fortuitous time, as the Ministry of Internal Affairs and Communications released important news on population trends on Sunday. According to the ministry’s figures, the amount of people in Japan 65 or older was a record 32.96 million, representing 25.9 percent of the country’s total population, another statistical record. The percentage of the more advanced age segment of those 75 and older also increased to a record 12.5 percent, the first time this age cohort has comprised one-eighth of the population. Any new government policy will have to address the joint problems of an aging population that will soon begin a rapid decline in size. To address these problems, as well as the issue of population flight from the countryside to major cities, Abe promised on Friday “bold measures completely different from previous ones.” He was speaking at the government task force on local revitalization’s first meeting. Among its many initiatives, Abe said the panel would help local communities to revitalize their economies, “and correct overconcentration of the population in Tokyo,” as well as “focus on job creation and other steps crucial for creating a better environment for young couples and parents.” The task force’s overall goal is to complete a comprehensive five-year revitalization strategy by the end of the year, and create a long-term strategy that would encompass the next 50 years. Abe’s wait-and-see approach on the tax increase issue is probably prudent at this time, as he can’t be seen as too eager before the next quarter’s growth data is released. A quarter-on-quarter increase is likely, and annualized gains could be at three to five percent, according to analyst projections from Reuters. In mid-August, chief economist for Bank of America Merrill Lynch, Masayuki Kichikawa, said there was a 70 to 80 percent chance that Abe would go through with the second tax hike, but in tandem with another fiscal stimulus package. The likelihood that Abe could garner enough popular support to go ahead with the tax increase if he pairs it with further stimulus is good, as long as the third quarter data remains positive. The chances for Abe’s new revitalization strategy to help small towns experiencing population flight could also be positive in the short to medium-term, before Japan’s population crunch really begins to take hold. The only problem is that there has not been much mention recently of how to address the systemic problem of Japan’s notoriously low fertility rate, well below the 2.1 replacement level at 1.3. That would require a massive reconceptualization of Japanese work culture, giving not only greater tax incentives and government enforced flexibility to parents, but also addressing more diffuse problems such as the increased cost of childcare and a decline in interest in marriage. Immigration reform is the only other clear solution, although it carries implied concerns about “social stability” that many people and politicians are not willing to discuss seriously yet. Abe’s tax reform has a much more realistic chance of being implemented, and even being successful, in the short-term. While the revitalization strategy could help certain locations for a brief period, it has yet to include the type of reforms necessary for an issue as potentially massive as Japan’s emerging population challenges.